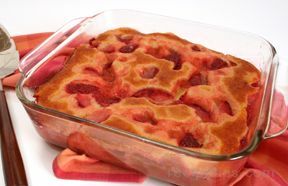 1 package strawberry gelatin, 3 oz. pkg. In a bowl, combine flour and brown sugar. Cut in butter until crumbly. Stir in the oats. 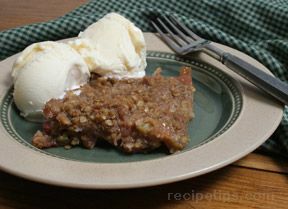 Press half into a greased 13 x 9 inch by 2 inch deep baking dish; top with rhubarb. 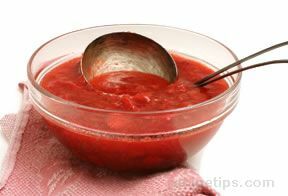 In a saucepan, combine sugar and cornstarch; stir in water until smooth. Remove from the heat; stir in vanilla. Pour over rhubarb. Sprinkle with gelatin powder. Top with remaining crumb mixture. 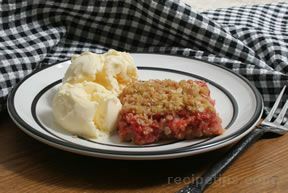 Bake at 350° F for 40-45 minutes or until rhubarb is tender and topping is golden brown. Serve with ice cream if desired.